In 2008, Metavari, a Fort Wayne-based instrumental “post-rock” band, was performing at Down the Line 2, an annual fund-raiser for the Embassy boasting a line-up of original local bands paying tribute to their influences. Though Metavari’s inclusion that night alongside the Possum Trot Orchestra, I, Wombat, The B-Sharps (with Kenny Taylor) and Moser Woods was hardly unusual, the artist Metavari chose to cover was enough to make even the most open-minded musicologist scratch his or her head in puzzlement — The Beach Boys. And not just The Beach Boys. Metavari would be performing Pet Sounds. Just to re-cap, this was an instrumental band tackling a group renowned for their distinctive vocals. But anyone who caught the set heard something remarkable. Metavari wove the Beach Boys’ original recorded vocals with their own original music to create intricately layered arrangements that made you hear some of these classic songs with fresh ears. To pull off such an ambitious performance requires a lot of skill, not just technically but musically. It also requires a lot of guts (“Messing with Pet Sounds?! Who do you think you are?!”). But the three members of Metavari — Nate Utesch, Ty Brinneman, and Andrew McComas — are, in their own unassuming way, pretty ambitious when it comes to their music and what they do. With over two years of performing and touring under their belt and an E.P. (Ambling) to their credit, Metavari is finally set to release their first full-length album — Be One of Us and Hear No Noise — this month. It’ll come out in the US on Crossroads of America Records, a Bloomington-based label noted for signing the band Husband & Wife and re-releasing the vinyl version of Starflyer 59’s debut LP Silver. The band is also in negotiations with Japan-based label A Friend of Mine records about releasing the album in Japan, complete with custom packaging and bonus tracks. The open house for the Fort Wayne version of the exhibit happens at Artlink on Friday, August 14, and the exhibit will be available until August 16. It features artists such as Rebecca Stockert, photographer Joel Faurote, Daniel Dienelt, Sommer Stark and others. “This is an opportunity to showcase the work of many emerging artists, which speaks to the core of Artlink's mission," says Artlink director Deb Washler. A proper CD release show follows a couple weeks later on Friday, August 28 at Cinema Center Tech on the Indiana Tech campus. All the members of Metavari are involved in Fort Wayne’s art scene; Nate Utesch and Ty Brinneman were involved in the SOMA art gallery. Musically, Metavari is pretty meticulous in all aspects of their performance and composition, and the soundscapes they create in the studio and live are particularly suited to conjuring evocative imagery. “The words you would use to describe a film score are probably some of the same words we’d use to describe how we write and what we do,” says Nate Utesch. Utesch adds that the band has never played without video accompaniment. “For the most part, we actually collect and edit pieces in synch with each song and perform it every time,” he says. The video pieces can get pretty elaborate; the band has even been experimenting with video that reacts to the music in real time. “There’s a couple computer programs Nate came across, straight-up computer program, where you put a musical piece to it and it causes the images to ‘pop’ and do weird shapes,” explains Andrew McComas. “When we discovered it, it was kind of like a missing element in what we wanted to do. It gets me so geeky excited, because it kind of completes our performance,” he laughs. The meticulous approach to the visual part of a Metavari performance is amplified to the nth degree when the band is composing or recording. To try to simplify it as much as possible, the band processes, manipulates, and edits a wide range of audio material — from “found sound” to actual instruments — to get the sounds they want. The album also features contributions by Nashville musician Timbre Cierpke, who has worked with indie bands mewithoutyou and Anathallo, on harp and vocals. “Basically, we made synths out Timbre’s vocals and harp playing,” says Brinneman. If all this sounds like it might be difficult to reproduce on stage… well, sometimes it is. One of the criticisms of “post-rock instrumental bands” — a category that, for lack of a better term, Metavari identify with — is that the layering of sounds, the use of computers and programming, the reliance on absolute precision, doesn’t leave much room for improvisation during performance. 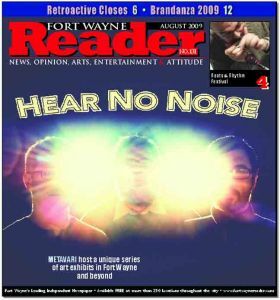 Fort Wayne artist Sommer Stark, who hopes to create a wall-mounted installation composed of polyester and cotton thread on site the night before and morning of the opening, was very intrigued by the phrase “Hear No Noise.” “It can be interpreted literally or abstractly, as an asset or a hindrance, and etc. I love that is has that polarity,” she says. 9 people	reviwed this story with an average rating of 4.7.